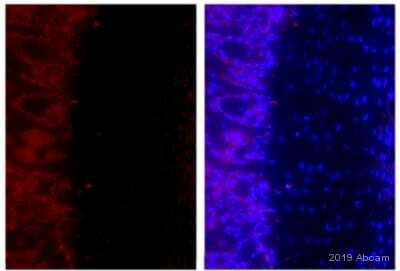 The antibody preferentially recognizes the p17 fragment of the active Caspase-3. Under the conditions we tested, the antibody did not detect the precursor form. 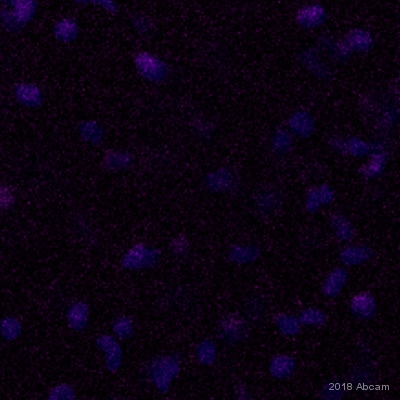 Under other conditions (such as those used in PMC2206181), this antibody has been found to detect both the pro and active forms of Caspase-3. 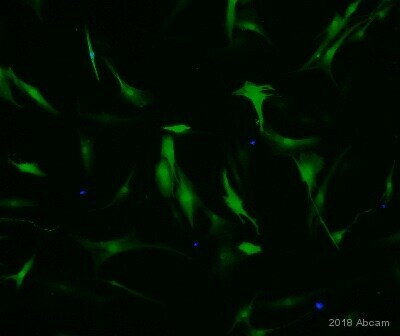 Although some customers have used this antibody successfully in mouse and rat, we do not batch test in these species and so cannot guarantee that it will work in them. Camptothecin (2 µM) treated Jurkat cells. If no signal is observed a time course may be required to identify maximal caspase activity. Caspases are synthesized as inactive pro-enzymes that are processed to active form in cells undergoing apoptosis. Caspase 3 has been extensively studied and implicated to play an important role in apoptosis. Active caspase 3 proteolytically cleaves and activates other caspases, as well as relevant targets in the cells (e.g., PARP). 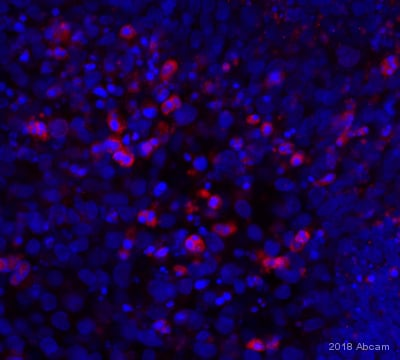 This affinity purified antibody recognizing the active forms of caspase-3 provides a new tool for identifying apoptotic cell populations in both tissue sections and cultured cells. Our Abpromise guarantee covers the use of ab2302 in the following tested applications. IHC-P Use a concentration of 5 - 20 µg/ml. 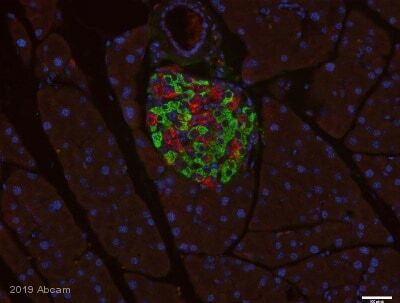 Perform heat mediated antigen retrieval via the microwave method before commencing with IHC staining protocol. WB Use a concentration of 1 µg/ml. Detects a band of approximately 17 kDa.Can be blocked with Human Caspase-3 peptide (ab38283). 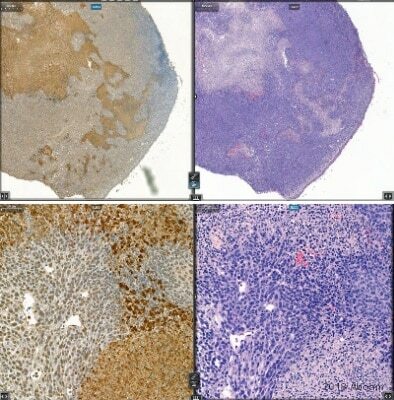 IHC image of cleaved caspase-3 staining in human tonsil formalin fixed paraffin embedded tissue section*, performed on a Leica Bond™ system using the standard protocol F. The section was pre-treated using heat mediated antigen retrieval with sodium citrate buffer (pH6, epitope retrieval solution 1) for 20 mins. The section was then incubated with ab2302, 1µg/ml, for 15 mins at room temperature and detected using an HRP conjugated compact polymer system. DAB was used as the chromogen. The section was then counterstained with haematoxylin and mounted with DPX. Additional bands at: 17 kDa (possible mature (processed) protein), 24 kDa, 35 kDa. We are unsure as to the identity of these extra bands. 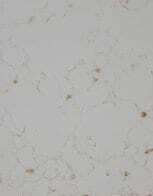 Immunohistochemistical detection (on formaldehyde/PFA-fixed paraffin-embedded sections) of cleaved Caspase-3 antibody (ab2302) on Quail Tissue sections (Quail E6/7 developing DRGs Saggital section). Antigen retrieval step: Heat mediated. Blocking step: 1% BSA for 10 mins RT. Primary Antibody ab2302 incubated at 1/50 for at RT. 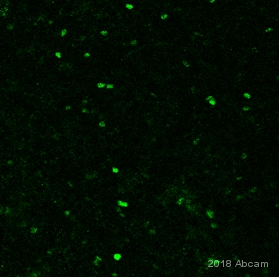 Secondary Antibody: Biotin conjugated goat anti rabbit IgG (1/300). ab2302 staining cleaved Caspase-3 in human ulcerative colitis, colon tissue sections by Immunohistochemistry (IHC-P - paraformaldehyde-fixed, paraffin-embedded sections). Tissue was fixed using the HOPE method and permeabilized. Samples were incubated with primary antibody (1/20) for 1 hour at 25°C. A Biotin-SP-conjugated donkey anti-rabbit IgG polyclonal (1/800) was used as the secondary antibody. (2 µM) treated Jurkat cells. Lung sections were stained with caspase antibody ab2302. Caspase-3 positive cells are shown in brown (DAB). This picture was kindly supplied as part of a customer review. Publishing research using ab2302? Please let us know so that we can cite the reference in this datasheet.